Okay, maybe it's not a real 3-d ball, but it rules. More info??? I've seen a few of these but not this particular one, nice Brooks saddle for sure. Wait a minute??? 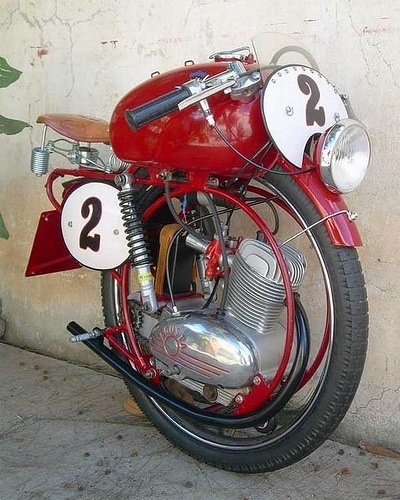 is that an MV Agusta 125cc TRL motor??? Hoo boy. That thing has got to be a handful to ride. I found out the machine's origins but I'll wait to see if drives anybody else as nuts as it did me. It is the "MV Augusta 60cc Monomoto Superleggera"(though I don't recall an MV ever being that small?) Its a piece of motorcycle art somebody put together for the Daytona 2007 Antique & Classic Motorcycle Auction, still trying to track down who actually did all the putting together stuff. 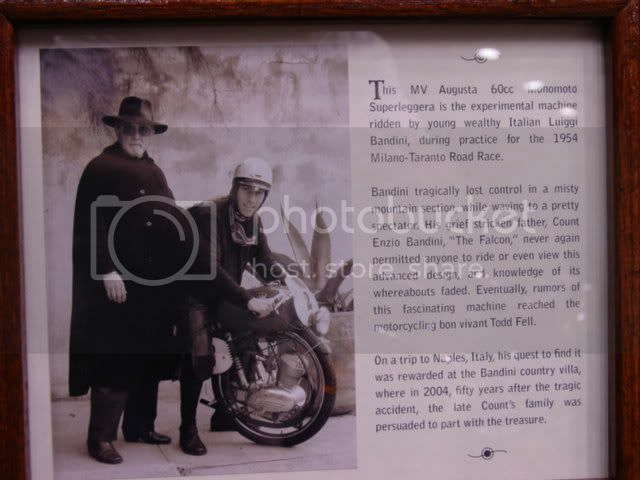 Here is the page link, Ctrl-F for superleggera and it will take you right to it but if you enjoy old bikes just scroll your way on down to it, lots of choice old Motorcycle iron with pics. I can picture some of the Site Authors here on this particular piece! I suspected the story I found was a fake once I recognized famed guitar virtuoso Esteban in the photo. Thanks for the cool info. Now: Is the Bombardier a hoax? I think the Embrio might actually be something they are trying to make work, I've kind of watching that one for a while now, I figure if they can make the Segway work, they might be able to make something like the Embrio work.